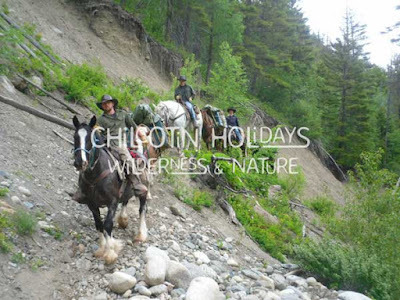 This story is a tribute to seven wranglers at Chilcotin Holidays, who shared the knowledge, experience and laughter of the One Week Wilderness Guide Training Program that would last a lifetime. To Darrel, Jim, Allen, John, Joe, Kim and Todd. They say once you see the mountains of British Columbia, you are drawn to a life that is unknown to civilization. It was on this same date in June that five men had a opportunity to meet and share the experience of lifetime. Sitting around the dining room table they introduced themselves to each other and shared what experience they had. After lunch, they met Darrel, their instructor and lead guide. In the first three days, the Training was at "home on the range." The second night experience included the "wet wrangler" while listening for bells and looking for horses in the mountains. After looking all over the mountains for tracks, the wranglers had their fill, gave up the chase, and returned to the Ranch. The only thing you could hear was the sound of the squeaking saddles coming up the long entrance to the Ranch. The wranglers unsaddled their at 10.30pm and put them out to graze. Wednesday morning came, and the wrangler loaded their horses and guests, then rode off to apply their skills in the high country. Riding to Spruce Lake, the wranglers stopped for a lunch break and a cup of cowboy coffee. Finally arriving at the cabin, they unloaded and prepared dinner. Some went to hobble the horses.